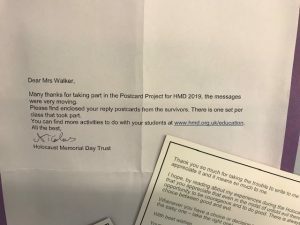 Following on from Holocaust Memorial Day on 27th January 2019, pupils in Key Stage Three Humanities lessons have written postcards to survivors of genocide. We have used resources on the trust’s website to learn about the experiences of Renee Bornstein and Sokphal Din. 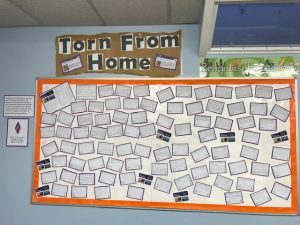 The four classes of Year 7 and 8 pupils have written postcards to these very brave survivors to explain the impact of these stories on their own lives. I am very proud of the pupils’ continued hard work. This entry was posted in Federation News, Lower School News, Middle School News on 28 Feb 2019 by school.